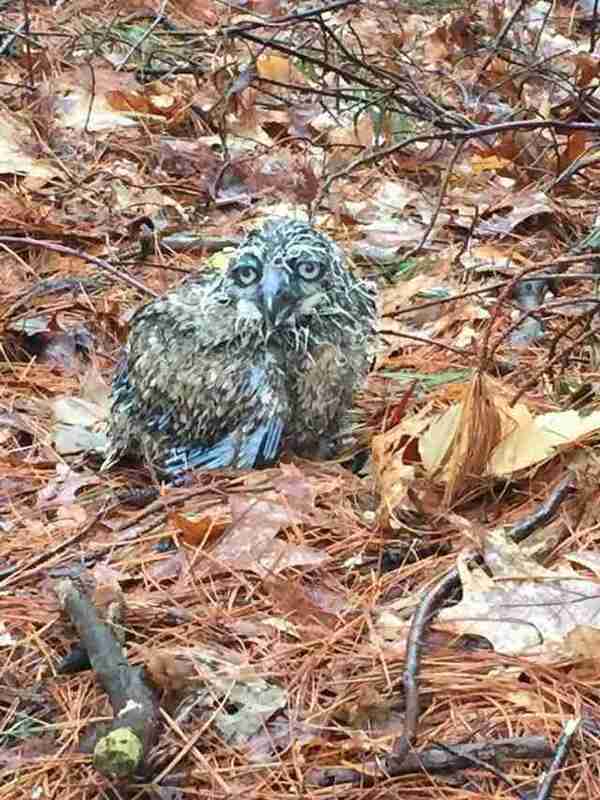 This week, someone walking their dog through a park in Longmeadow, Massachusetts, happened upon a very sad and sorry sight. 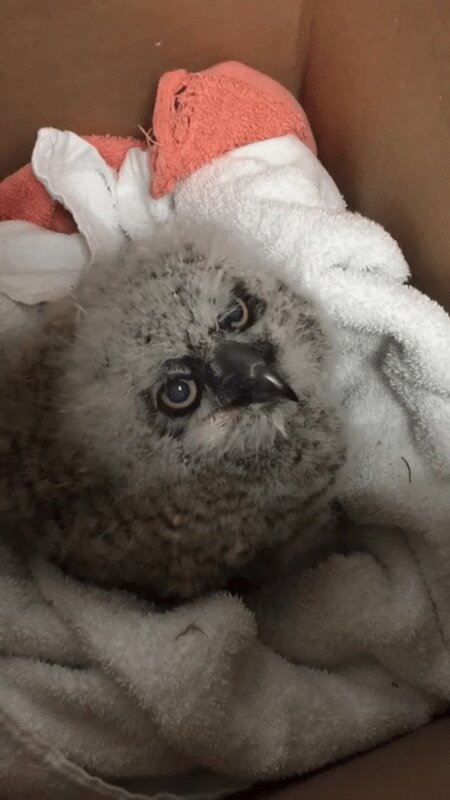 There, rain-soaked and shivering on the ground, was a stranded baby great horned owl. He'd evidently tumbled out of his nest and had no way of getting back. And it was clear from the looks of him that the little guy had already given up all hope. What the little owl didn't know, of course, was that help would soon be on the way. The person who found him contacted the Longmeadow Police Department. That's when Officer Peter MacElhiney drove out to lend a hand. "This was the first time I've handled a young owl," MacElhiney told The Dodo. "We see them in town, but very rarely. Its talons were well developed and could definitely hurt someone. It's always neat to be able to help a creature out, but at the time I didn't know if it would have been best to just leave it." Considering the owl was wet and freezing, and susceptible to being attacked by a predator where he was, MacElhiney decided to carry him to safety. The little owl was now in good hands (even though he didn't seem totally convinced of that at the time). MacElhiney brought the owl back to the station in a box. 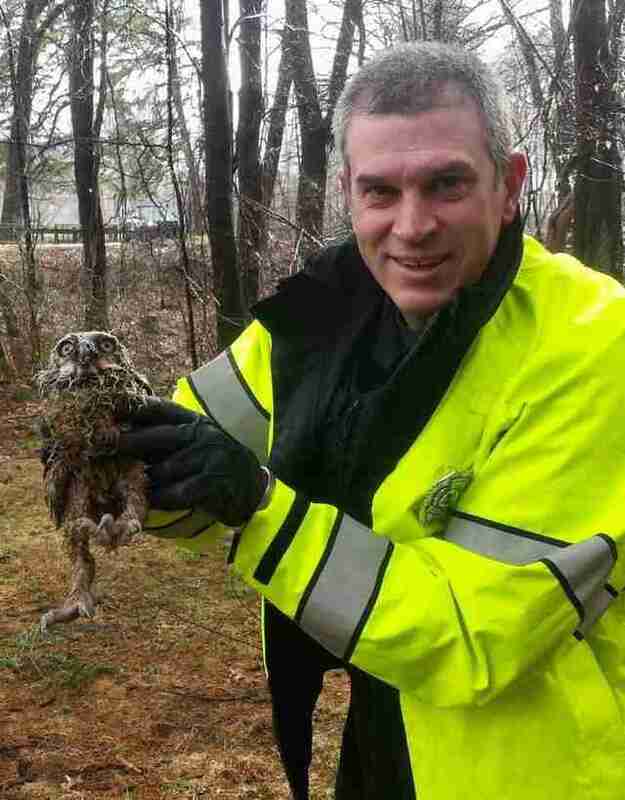 Afterward, he reached out to Thomas Ricardi, manager of the Massachusetts Birds of Prey Rehab Facility; he happens to know a feathered couple who are best equipped to help. "The owl will be raised by two adult owls he has," MacElhiney said. "His goal is to release the birds if they gain the ability to fend for themselves." 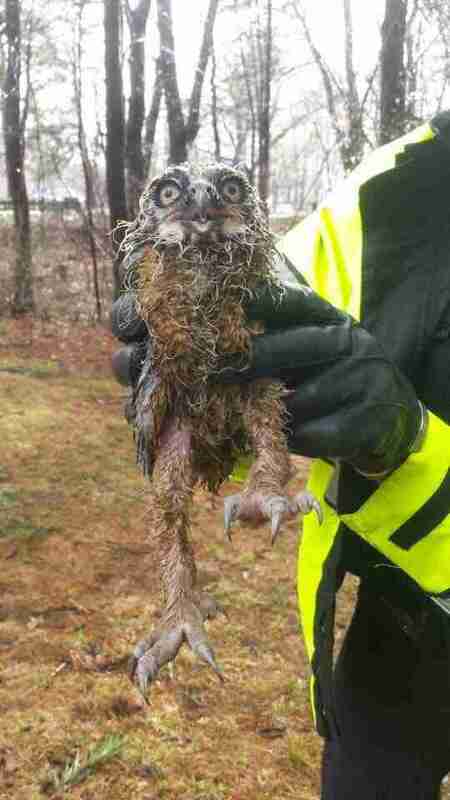 With any luck, the unfortunate owl's rough start to life won't prevent him from thriving in the future. And thanks to those who stepped in to save him, things are already looking up.